In the present generation, most of the people are having the smartphone, PC, tablet in our home. We all need the Internet for all these devices. Everyone will be having Internet connection for sure but few them only have routers with them at home. If we want to use internet on all devices then we must have to take another data plan. That will increase unnecessary cost. To cut these extra expenses we can have a single data connection to PC and then use that PC to create a hotspot. See create a WiFi hotspot using command prompt in windows 8. If you are Using Windows 8.1 you can find a more easy way than this. Links are given below. 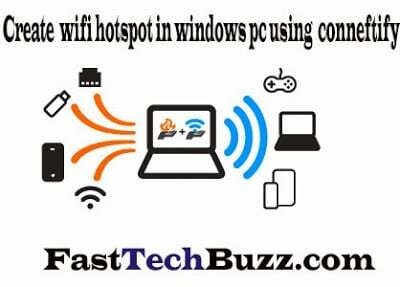 It is very very easy to create a WiFi hotspot in windows 7,8 PC.There are only few software available for this but today I am going to tell you about the best software.I will tell you how to create WiFi network using the best software. If you are ready to create WiFi hotspot network in your Windows 7 PC then follow the below instructions. Download the latest version of Connectify Hotspot from this link. Remember this software is not free but I am giving a link to the full version.The official site will give you 2 day trail version only. Restart your PC after installing the software. After installing open the software from installed applications then you will see a image like below. Then enter your WiFi name, password click on start. That’s it your are done. If you want to use full features of Connectify – hotspot you have to buy full version and support the developers. you can see who are using your WiFi in clients tab that is marked in red color. you can share your internet connection with full speed within the range of WiFi network. You can protect your WiFi with password. You can share your files also easily. To secure your computer from viruses : Best free Anti Virus for windows 8. I hope this tutorial helped you to create wifi hotspot in windows 7. If you think this article helped you like this one. Followed all the above steps but the software shows that it’s only pro feature.Please help to create wifi hotspot in windows 7. Thanks for the tutorial bro. I created hotspot with this but i want to make hotspot with command prompt.Please tell me how can i create with CMD. Check out this article to create hotspot with CMD. Just downloaded the wi fi ConnectifyInstaller but can’t install. what should I do? i am using a mts dongle as a net connection .the speed is quite good.but using connectify the phone is getting connected with my laptop but i could not have any access to internet through my phone.please help!!! I have basis optimum cable in my apartment (NO INTERNET). I do have Wi-Fi on my RCA tablet. This is through my apartment complex free Wi-Fi. I.do have an old Dell microsoft XP pc. Now for my very ignorant; how do I make that PC Wi-Fi without an internet connection? Restart your PC. If you are still getting the same error message update your WiFi drivers. Bro Vineet Kumar. Define your ph. OS first eg. : Windows CE / Windows 8 etc. Because the atmosphere for hotspot required some algorithms, which need .net 4.0 (latest wifi). Just go to internet sharing in “Settings” and on it, that’s it, you are done. And if you are asking about to sharing of shared connection, then it may not. Hello, May I use it in XP3. i am trying to install connectify in pc but got error like connectify work properly with windows 7 sp1. but i have windows 7 professional. Not so nice is that after installing you will find out that you need to activate the software every 30 minutes otherwise it stops or you have to buy the full version. And wind 7 also had a build in possibility. my computer have not bluetooth . what can i do? unable to connect in my asus zenfone 5 .
how about Windows 10? can i use the same method to create the wifi hotspot? Yes bro. You can use the same method for windows 10 also.